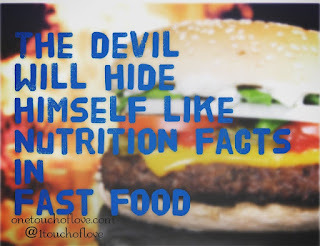 Many times we go to restaurants, especially fast food places, and order without knowing all of the nutrition facts. We just want to eat. Sometimes it doesn't matter but we crave what sounds good and looks good. However, this is not always good for us. 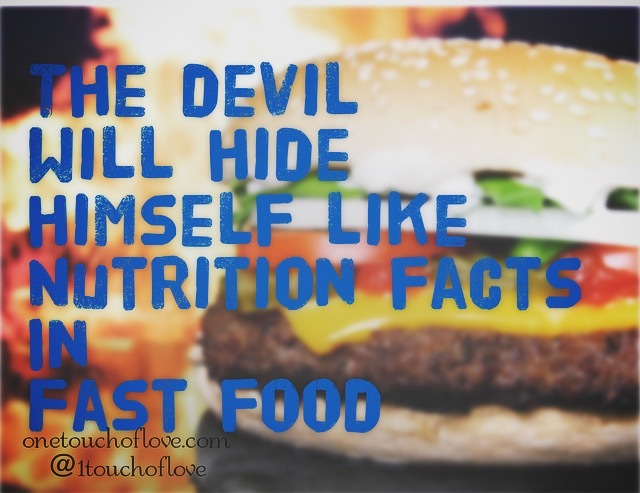 If we keep satisfying those cravings on a daily basis, before we know it we've gained weight and an unhealthy body. Then we have to work hard to get rid of it. The weight gain could have been prevented if we knew the nutrition facts to help us make better choices. The enemy does us the same way with making choices in life. We go for what looks good and sounds good but it's not necessarily good for us. If we choose our relationships this way we end up being with someone who isn't good for us and have gained all these spirits that we have to work hard to get rid of. It can also be just us not spending enough time with God. We get so caught up with life with the hustle and bustle that we neglect our relationship with Him. We end up getting filled up with the wrong thoughts, emotions and spirits that God didn't intend for us to have. The things that the enemy fills us up with will have us feeling empty, but that feeling is a lie. Jesus gave us is Holy Spirit when He went up to sit on His throne. His Spirit is full of power, joy, love and peace, we should be feeling those ALL the time. 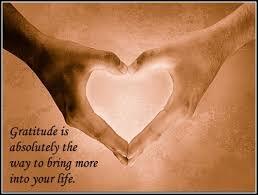 If you don't feel peace and joy in your life then it's time for a spiritual diet. We have to be mindful that the devil is real and he wants to destroy our relationship with God. We can't let him hide himself like the nutrition facts at fast food restaurants any more. We have to put on the full armor of God and be able to stand firm when he tries to distract us from our relationship with God.